Questions for the Environment Committee - Are they getting half the story? Next Tuesday is the Environment Committee will consider some massive changes to the refuse service (which you can read here) including the removal of the food waste brown bin collection and a suspension of green bin collection for 3 months over the winter. I have been through the report in detail and have submitted the following questions. It will be interesting to see what answers I get. At 1.4 in the report it identifies the problem with the transfer station floor and attributes the blame to Wilmott Dixon. At some point during the construction process a surveyor must have signed off this element of construction in order for Wilmott Dixon to be paid. If the floor was not laid to the correct specification why wasn’t this picked up at that stage and does this call into question the quality of project management? I was told by a councillor that they were told the floor repair would only take “a couple of days” yet the disruption caused seemed to last much longer. How long was this area out of action and why were councillors given inaccurate information? Other than Harrow have there been any other benchmarks to give confidence that the payment rate for littering will not fall when the early payment discount is removed? Have you calculated the impact of stopping the early payment discount on small businesses who may have failed to get their duty of care paperwork in order within 7 days given the pressures they are under already? Have you asked NSL why they have failed to collect two thirds of the flytipping fines given that if they were collected at the same rate as other fines (72%) that would generate an additional £107,000 of income? How much of the total environmental enforcement fine income comes to the council and how much goes to NSL and who will benefit most from the removal of this early payment discount, LBB or NSL? At 1.11 the report identifies the cost of the waste and recycling service. How much extra does it cost having to run the service out of two depots including one which is outside of the borough and would costs be reduced if all services were run from one depot? At 1.17 the report talks about double shifting. Please can you clarify at what time the earliest rounds would start and at what time would the latest rounds finish? At 1.17 the report talks about local alternative bulking points. Given the difficulty in finding the Oakleigh Road Depot and the likely planning opposition you will get from residents when they find they are going to have waste tipped and bulked close to their homes, do you think this is a realistic option? At 1.22 you state that the cost of separate food waste collection is approximately £300,000 per annum. Given that it is collected with the blue bins by the same crew, that the food waste is tipped into a compartment on the blue waste refuse vehicle, can you explain how the £300,000 saving is calculated. To what extent will the removal of brown bins and the combining of food and general waste undermine the Courtauld Commitment 2025 to reduce food waste especially if you can’t measure it? Have the council undertaken any of the initiatives set out in WRAP Household food waste collections guidance: Section 11 which saw tonnage rates increase in 18 of the 19 pilot projects and with more than half showing tonnage rates increase by more than 13% (with the highest at 62%)? To what extent will the 20% reduction in throughput of the IVC at Edmonton affect its viability and what was NLWA response to this proposed reduction.? Has anyone considered what signal the withdrawal of food bin will sent to residents and is the risk that it will be interpreted that people can throw anything in the black bin, impacting recycling rates? What will happen to all the redundant brown bins and kitchen caddies and what is the cost of recycling them? To what extent will the removal of the last 16 bring sites lead to more flytipping or recyclable product being thrown in the black bins? In the 3 month winter period 2016/17 how much green waste was collected? What is the risk that green waste will either be flytipped or put into black bins when the green bin collection is suspended. To what extent have you consulted with the many small gardening businesses in Barnet who work through the winter and typically place the garden waste they gather at a resident’s home in the resident’s green bin and has anyone asked them what the impact may be either in term of cost or whether their services simply will not be used during the suspension period? Will green bin collection staff be laid off during the service suspension and how easy will it be to ramp up staffing levels when the service recommences? Why do private contractors have to comply with time banded collections in town centre, will it make it more inconvenient/expensive for them and is this simply a strategy to give the council’s commercial waste collection an unfair advantage? Given that the energy cost of streetlighting is underspent will you take this opportunity to increase the lux levels of streetlight which are now at an unreasonably low level? 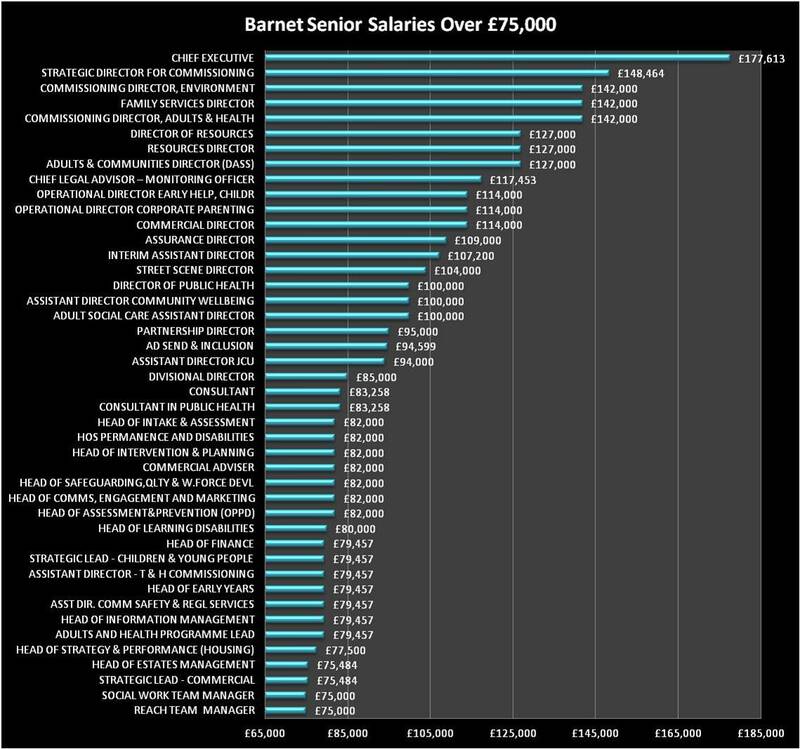 Over the next three years Barnet is going to experience a serious financial shortfall. By 2020/21 there will be a budget gap of £32.5 million. Those aren't my figures; they are the forecasts in Barnet's Medium Term Financial Strategy (MTFS) which you can see here. To set that £32.5 million shortfall in context, the total revenue raised from council tax is around £160 million so the shortfall is around 20% of the total council tax revenue. Part of the problem is the cuts from central government. However, Barnet have insisted on a policy of council tax freezes since 2010 which has stored up a massive problem that will now be coming home to roost. The cynic in me thinks that the Conservatives didn't take a council tax rise in April (other than the social care precept) because they thought Labour would win and be forced to increase council tax, labelling them as the tax raising party. Barnet could have increased the council tax element by the 2.99% allowed. Many councils have taken that rise knowing that come 2020/21 there is going to be a meltdown in local authority finances. This year there will be £9 million of service reductions and next year that rises to £12 million but come 2020/21 who knows what cuts will be made? They will have to be huge. A very bleak outlook. So that leads me back to the title of this blog. Barnet are making cuts to lots of services. They, or rather Capita who run the finance function in Barnet, are reviewing all of the contracts and services to see where savings can be made. However, one of the largest contracts seems to be exempt from this process and that is Capita. Well that's no surprise; why would Capita look at saving money on its own contract; Turkeys, Christmas and all that? If you look how much money we have paid Capita since the start of the contract it is a somewhat shocking £335 million. The CSG contract contains an indexation clause which means it automatically rises each year and because services are contractually specified it is very hard to make savings by reducing the service Capita provide. 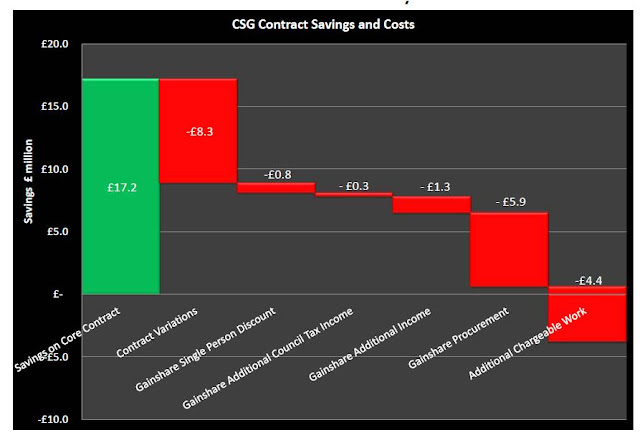 If we look at the CSG contract, Barnet say they have made savings on the core contract. The problem is we are paying a fortune for everything else. Set out below is a chart that shows how those savings have been eroded even before you add in the massive payments for special projects, charged at consultancy rates which we are forbidden to know. According to the Council's figures, the savings to date on the core contract are £17.2 million, which looks good, but then you have to deduct all the elements which Capita claim back from Barnet. The scale of contract variations illustrate the complexity of the contract, the problems of missing out elements and the fact that with such a long contract period (10 years with the option to extend for another 5 years) means that requirements will inevitably change. The gainshare on reducing the number of people claiming the Single Person Discount and additional council tax income seems strange to me as Capita are already being paid to provide those services. So in effect we are paying for poor service and rewarding them extra for delivering the service we have every right to expect in the first place. I haven't seen the specific details of what they have generated on the additional income but Capita are allowed to offset all of their costs before claiming a share. As a result, they take 47% of the additional income generated and that doesn't seem fair to me. On the procurement gainshare I have blogged about this repeatedly. I have challenged with the external auditor the right of Capita to claim gainshare on framework contracts (contracts that are available to public sector organisations) and which could have been accessed by Barnet council staff. In total Capita are forecast to claim £23.4 million in procurement gainshare and "Agreed Procurement Price Recovery". There is then additional work. For example, last year Capita claimed £428,267 for additional caseload on revenues and benefits work. Every element of work in the contract has a volume attached to that and if we go over that limit we pay extra. I thought the number of people claiming benefits was going down but apparently not in Barnet. From my perspective, the payments to Capita at £335 million should be one of the first areas Barnet looks at to save money if there is any chance of meeting the £32.5 million shortfall come 2020/21. But because the outsourcing programme is so high profile there seems a complete reluctance to look at any possible changes. Barnet need to be brave and look at their contract with as much rigor as they are for other vital services, such as Children's Services and Adult Social Care. So to Capita I would say - Physician Heal Thyself . 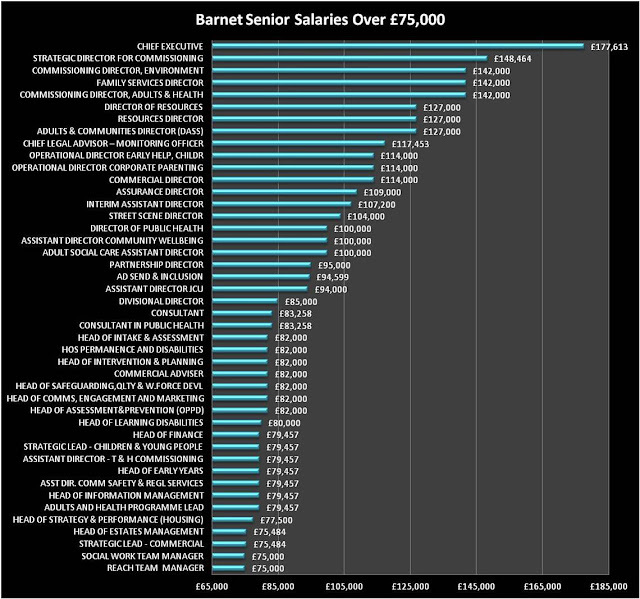 I like to keep an eye on Barnet senior salaries which are published on a monthly basis; you can read them here. The list looked longer than I was expecting so I investigated a bit further. Last August a number of staff got some very large pay rises so I compared the May 2018 senior salaries list to the same list from December 2017. 1 staff member did get promoted to a new role and got a £21,000 pay rise. With so much talk about cuts to services it does seem rather strange so many new posts have been created and such substantial pay rises have been pushed through. In terms of the new posts I suspect that part of this increase is merely a reflection of the reduction in interim and agency staff whereby interim staff are being taken off agency status and taken on as full time staff due the tightening up of tax rules for the self employed by HMRC. In terms of the pay rises, last time I raised this with Richard Cornelius he said it was necessary to stop staff from leaving. Maybe the Council should look a little deeper as to why staff want to leave? Today Barnet have published the March 2018 supplier payments which give us a complete picture for the financial year. In March Capita were paid £7.3 million and Re were paid £1.04 million with Comensura receiving just under £2 million. Other interesting payments include £101,202.76 to Blue 9 Security. It would be helpful to understand how much of that is for the additional security staff at our "unmanned" libraries. By way of comparison in the financial year 2014-15 Blue 9 Security were paid £581,632 but this financial year, 2017-18, they were paid £1,149,873. So in three years the cost of security have doubled with the only significant variable being the introduction of security staff at libraries. We paid PA Consulting £219,950 for "IT & Comms". Now we have Capita who are supposed to run the council's IT services so what are we paying an external consultancy £219,950 for and who authorised it? Albeit a more modest sum, we paid an organisation called Policy into Practice £20,317. One of the services they provide is Council Tax reduction modelling; you can see what they provide here. 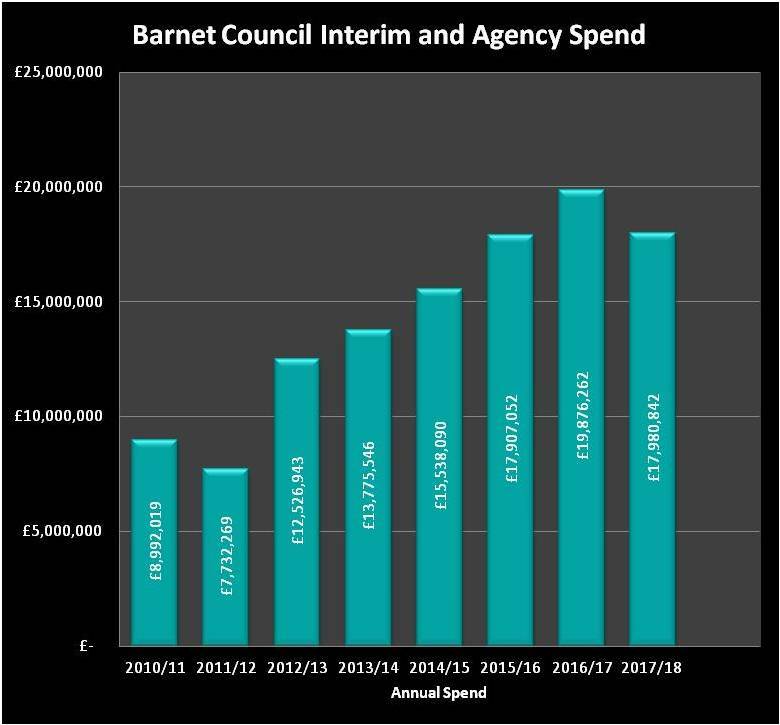 I don't know if that is what they helped with but it does seem to coincide with Barnet's plans to increase the amount the poorest families in Barnet have to pay towards their Council Tax next year see here. So as we are at the year end I thought it would be helpful to summarise the key spending this year. 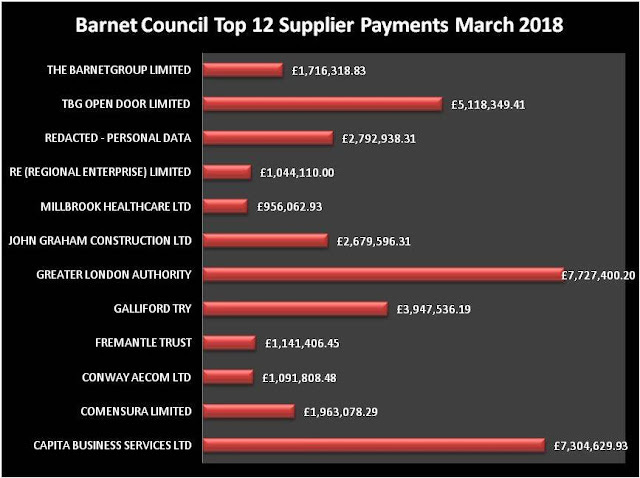 Set out below is the chart showing the top 10 supplier payments for 2017/18. 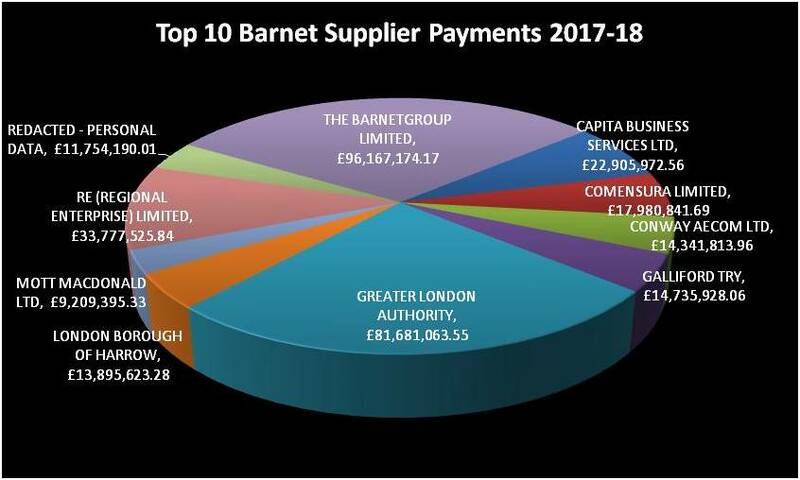 Other than the Barnet Group and the Greater London Authority the three largest supplier payments are to Re, Capita and Comensura all of which deserve greater scrutiny. One thing to bear in mind with the Capita payments is that we made a large advance payment last year which is why payments this year have been lower - although I don't think that will be happening again any time soon. Set out below is the year end summary of the Capita and Re contracts. From this you can see that the contracted value to date of the two contracts is £211 million but, in addition to that contracted value, we have paid a further £124 million for all the extra services, special projects, contract variations, excess charges and gainshare. 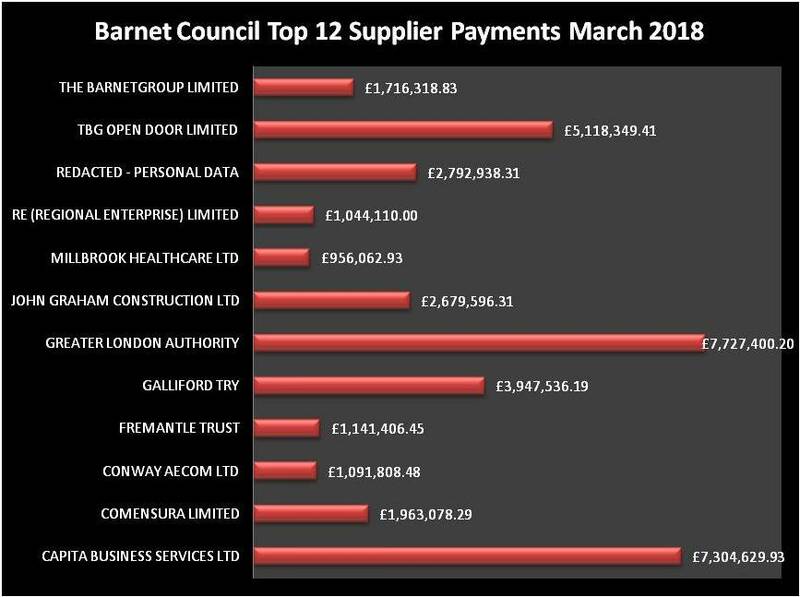 When Richard Cornelius keeps saying this contract is saving Barnet residents £1 million a month, perhaps you can understand why I find that hard to believe. Yes the core contract may be saving money but we are paying a fortune for the extras and that seems to more than cancel out any potential savings. As yet I still haven't had a resolution to my objections to the accounts for 2016/17 in relation to gainshare payments to Capita and we are now a month into 2018/19. We also pay a fortune to a company called Comensura who supply the council with agency and interim staff. Having hit a high water mark of almost £20 million last year there was a concerted attempt to make inroads into that figure in 2017-18. Sadly the reduction has only been around 10% so we are back to where we were in 2015/16 but still at more than double the spend of 2011/12. In the 12 months prior to the commencement of the Capita contract, the council used significantly more agency staff. This was because many staff were leaving the council to avoid being made redundant and it was almost impossible to recruit new staff as they knew they would soon find themselves out of a job. Yet nearly five years into the contract with Capita we are still using large numbers of agency staff in far fewer service areas. That indicates to me an organisation that has lost its way, that can't hold a fixed workforce, that isn't doing its utmost to engage, motivate and retain its most valuable resource, its employees. It is time for a change in Barnet and on Thursday Barnet residents can use their vote to bring about that change. Please make that vote count.